"Elect" redirects here. For other uses, see -elect and Election (disambiguation). "Free election" redirects here. For the "free elections" of Polish kings, see Royal elections in Poland. An election is a formal group decision-making process by which a population chooses an individual to hold public office. Elections have been the usual mechanism by which modern representative democracy has operated since the 17th century. Elections may fill offices in the legislature, sometimes in the executive and judiciary, and for regional and local government. This process is also used in many other private and business organizations, from clubs to voluntary associations and corporations. To elect means "to choose or make a decision", and so sometimes other forms of ballot such as referendums are referred to as elections, especially in the United States. 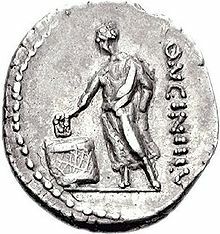 Elections were used as early in history as ancient Greece and ancient Rome, and throughout the Medieval period to select rulers such as the Holy Roman Emperor (see imperial election) and the pope (see papal election). In Vedic period of India, the Raja (chiefs) of a gana (a tribal organization) was apparently elected by the gana. The Raja belonged to the noble Kshatriya varna (warrior class), and was typically a son of the previous Raja. However, the gana members had the final say in his elections. Even during the Sangam Period people elected their representatives by casting their votes and the ballot boxes (Usually a pot) were tied by rope and sealed. After the election the votes were taken out and counted. The Pala King Gopala (ruled c. 750s–770s CE) in early medieval Bengal was elected by a group of feudal chieftains. Such elections were quite common in contemporary societies of the region. In the Chola Empire, around 920 CE, in Uthiramerur (in present-day Tamil Nadu), palm leaves were used for selecting the village committee members. The leaves, with candidate names written on them, were put inside a mud pot. To select the committee members, a young boy was asked to take out as many leaves as the number of positions available. This was known as the Kudavolai system. The modern "election", which consists of public elections of government officials, didn't emerge until the beginning of the 17th century when the idea of representative government took hold in North America and Europe. Questions of suffrage, especially suffrage for minority groups, have dominated the history of elections. Males, the dominant cultural group in North America and Europe, often dominated the electorate and continue to do so in many countries. Early elections in countries such as the United Kingdom and the United States were dominated by landed or ruling class males. However, by 1920 all Western European and North American democracies had universal adult male suffrage (except Switzerland) and many countries began to consider women's suffrage. Despite legally mandated universal suffrage for adult males, political barriers were sometimes erected to prevent fair access to elections (see civil rights movement). The question of who may vote is a central issue in elections. The electorate does not generally include the entire population; for example, many countries prohibit those who are under the age of majority from voting, all jurisdictions require a minimum age for voting. In Australia, Aboriginal people were not given the right to vote until 1962 (see 1967 referendum entry) and in 2010 the federal government removed the rights of prisoners serving for 3 years or more to vote (a large proportion of which are Aboriginal Australians). Suffrage is typically only for citizens of the country, though further limits may be imposed. However, in the European Union, one can vote in municipal elections if one lives in the municipality and is an EU citizen; the nationality of the country of residence is not required. In some countries, voting is required by law; if an eligible voter does not cast a vote, he or she may be subject to punitive measures such as a fine. In Western Australia, the penalty for a first time offender failing to vote is a $20.00 fine, which increases to $50.00 if the offender refused to vote prior. A representative democracy requires a procedure to govern nomination for political office. In many cases, nomination for office is mediated through preselection processes in organized political parties. Non-partisan systems tend to differ from partisan systems as concerns nominations. In a direct democracy, one type of non-partisan democracy, any eligible person can be nominated. 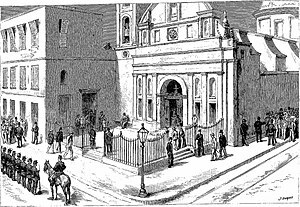 Although elections were used in ancient Athens, in Rome, and in the selection of popes and Holy Roman emperors, the origins of elections in the contemporary world lie in the gradual emergence of representative government in Europe and North America beginning in the 17th century. In some systems no nominations take place at all, with voters free to choose any person at the time of voting—with some possible exceptions such as through a minimum age requirement—in the jurisdiction. In such cases, it is not required (or even possible) that the members of the electorate be familiar with all of the eligible persons, though such systems may involve indirect elections at larger geographic levels to ensure that some first-hand familiarity among potential electees can exist at these levels (i.e., among the elected delegates). As far as partisan systems, in some countries, only members of a particular party can be nominated (see one-party state). Or, any eligible person can be nominated through a process; thus allowing him or her to be listed. Electoral systems are the detailed constitutional arrangements and voting systems that convert the vote into a political decision. The first step is to tally the votes, for which various vote counting systems and ballot types are used. Voting systems then determine the result on the basis of the tally. Most systems can be categorized as either proportional or majoritarian. Among the former are party-list proportional representation and additional member system. Among the latter are First Past the Post electoral system (relative majority) and absolute majority. Many countries have growing electoral reform movements, which advocate systems such as approval voting, single transferable vote, instant runoff voting or a Condorcet method; these methods are also gaining popularity for lesser elections in some countries where more important elections still use more traditional counting methods. While openness and accountability are usually considered cornerstones of a democratic system, the act of casting a vote and the content of a voter's ballot are usually an important exception. The secret ballot is a relatively modern development, but it is now considered crucial in most free and fair elections, as it limits the effectiveness of intimidation. The nature of democracy is that elected officials are accountable to the people, and they must return to the voters at prescribed intervals to seek their mandate to continue in office. For that reason most democratic constitutions provide that elections are held at fixed regular intervals. In the United States, elections for public offices are typically held between every two and six years in most states and at the federal level, with exceptions for elected judicial positions that may have longer terms of office. There is a variety of schedules, for example presidents: the President of Ireland is elected every seven years, the President of Russia and the President of Finland every six years, the President of France every five years, President of the United States every four years. Pre-determined or fixed election dates have the advantage of fairness and predictability. However, they tend to greatly lengthen campaigns, and make dissolving the legislature (parliamentary system) more problematic if the date should happen to fall at time when dissolution is inconvenient (e.g. when war breaks out). Other states (e.g., the United Kingdom) only set maximum time in office, and the executive decides exactly when within that limit it will actually go to the polls. In practice, this means the government remains in power for close to its full term, and choose an election date it calculates to be in its best interests (unless something special happens, such as a motion of no-confidence). This calculation depends on a number of variables, such as its performance in opinion polls and the size of its majority. When elections are called, politicians and their supporters attempt to influence policy by competing directly for the votes of constituents in what are called campaigns. Supporters for a campaign can be either formally organized or loosely affiliated, and frequently utilize campaign advertising. It is common for political scientists to attempt to predict elections via Political Forecasting methods. The most expensive election campaign included US$7 billion spent on the United States presidential election, 2012 and is followed by the US$5 billion spent on the Indian general election, 2014. Election Proceedings in Buenos Ayres: Voting under military protection (The Illustrated London News, 26 March 1892). In many countries with weak rule of law, the most common reason why elections do not meet international standards of being "free and fair" is interference from the incumbent government. Dictators may use the powers of the executive (police, martial law, censorship, physical implementation of the election mechanism, etc.) to remain in power despite popular opinion in favor of removal. Members of a particular faction in a legislature may use the power of the majority or supermajority (passing criminal laws, defining the electoral mechanisms including eligibility and district boundaries) to prevent the balance of power in the body from shifting to a rival faction due to an election. Non-governmental entities can also interfere with elections, through physical force, verbal intimidation, or fraud, which can result in improper casting or counting of votes. Monitoring for and minimizing electoral fraud is also an ongoing task in countries with strong traditions of free and fair elections. Problems that prevent an election from being "free and fair" take various forms. The electorate may be poorly informed about issues or candidates due to lack of freedom of the press, lack of objectivity in the press due to state or corporate control, and/or lack of access to news and political media. Freedom of speech may be curtailed by the state, favoring certain viewpoints or state propaganda. The Presidential Election in Argentina, the Polling Station at the Church of La Merced, Buenos Aires. "The rival voters were kept back by an armed force of police out of sight to others. Only batches of two or three were allowed to enter the polling-office at a time. Armed sentries guarded the gates and the doors leading to the office, and were also posted on the roofs of adjoining houses and in the belfry and tower of the church." (Godefroy Durand, The Graphic, 21 May 1892). Gerrymandering, exclusion of opposition candidates from eligibility for office, needlessly high restrictions on who may be a candidate, like ballot access rules, and manipulating thresholds for electoral success are some of the ways the structure of an election can be changed to favor a specific faction or candidate. Those in power may arrest or assassinate candidates, suppress or even criminalize campaigning, close campaign headquarters, harass or beat campaign workers, or intimidate voters with violence. Foreign electoral intervention can also occur. This can include confusing or misleading voters about how to vote, violation of the secret ballot, ballot stuffing, tampering with voting machines, destruction of legitimately cast ballots, voter suppression, voter registration fraud, failure to validate voter residency, fraudulent tabulation of results, and use of physical force or verbal intimation at polling places. Other examples include persuading candidates into not standing against them, such as through blackmailing, bribery, intimidation or physical violence. A sham election, or show election, is an election that is held purely for show; that is, without any significant political choice or real impact on results of election. Show elections are a common event in dictatorial regimes that feel the need to feign the appearance of public legitimacy. Published results usually show nearly 100% voter turnout and high support (close to 100% in many cases) for the prescribed candidate(s) or for the referendum choice that favors the political party in power. Dictatorial regimes can also organize show elections with results simulating those that might be achieved in democratic countries. Sometimes only one government approved candidate is allowed to run in sham elections with no opposition candidates allowed or opposition candidates are arrested on false charges or even without any charges before the election to prevent them from running. Examples of such elections are elections in Fascist Italy in 1929 and 1934, elections in Nazi Germany, Portuguese presidential election, 1958, most communist and socialist states (East Germany, the Soviet Union, China, North Korea, etc. ), and Baathist Iraq. A predetermined conclusion is always established by the regime, either through suppression of the opposition, coercion of voters, vote rigging, a forged number of "votes received" (e.g. the State of Vietnam referendum, 1955), outright lying, or some combination. In an extreme example, Charles D. B. King of Liberia claimed he received 243,000 votes in the 1927 general election, which exceeded the number of eligible voters over 15 times. 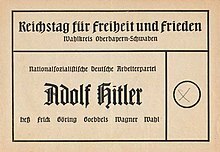 A ballot from the 1936 elections in Nazi Germany. Voters had no options other than Adolf Hitler. Ballots in a show election may contain only one "yes" option. In the case of a simple "yes or no" question, people who pick "no" are often persecuted, thus making the "yes" choice the only option. An example of this is the elections of the People's Parliaments in Estonia, Latvia, and Lithuania in 1940 shortly after the Soviet occupation of the Baltic states; where those who voted received stamps in their passport for voting and those who did not vote did not receive stamps and were persecuted as enemies of the people. Another example is in contemporary North Korea. In some cases, show elections can backfire against the party in power, especially if the regime believes they are popular enough to win without coercion or fraud. The most famous example of this was the 1990 Myanmar general election. ^ Robert, Henry M.; et al. (2011). Robert's Rules of Order Newly Revised (11th ed.). Philadelphia, PA: Da Capo Press. pp. 438–446. ISBN 978-0-306-82020-5. ^ Headlam, James Wycliffe (1891). Election by Lot at Athens. p. 12. ^ Eric W. Robinson (1997). The First Democracies: Early Popular Government Outside Athens. Franz Steiner Verlag. pp. 22–23. ISBN 978-3-515-06951-9. ^ Agananooru. Chennai: Saiva Siddantha Noor pathippu Kazhagam. 1968. pp. 183–186. ^ Nitish K. Sengupta (1 January 2011). "The Imperial Palas". Land of Two Rivers: A History of Bengal from the Mahabharata to Mujib. Penguin Books India. pp. 39–49. ISBN 978-0-14-341678-4. ^ Biplab Dasgupta (1 January 2005). European Trade and Colonial Conquest. Anthem Press. pp. 341–. ISBN 978-1-84331-029-7. ^ VK Agnihotri, ed. (2010). Indian History (26th ed.). Allied. pp. B-62–B-65. ISBN 978-81-8424-568-4. ^ "Pre-Independence Method of Election". Tamil Nadu State Election Commission, India. Archived from the original on 29 October 2011. Retrieved 3 November 2011. ^ "Failure to Vote | Western Australian Electoral Commission". www.elections.wa.gov.au. Retrieved 26 November 2018. ^ "India's spend on elections could challenge US record: report". NDTV.com. Retrieved 25 February 2016. ^ "Free and Fair Elections". Public Sphere Project. 2008. Retrieved 8 November 2015. ^ Inc., US Legal,. "Sham Election Law and Legal Definition | USLegal, Inc". definitions.uslegal.com. Retrieved 14 July 2018. ^ "Alexei Navalny latest: Russian opposition leader arrested ahead of presidential election | The Independent". ^ "Liberia past and present 1927 elections". ^ "RUSSIA: Justice in The Baltic". Time. 19 August 1940. ISSN 0040-781X. Retrieved 14 July 2018. ^ "Yes, There Are Elections in North Korea and Here's How They Work - The Atlantic". ^ "Burma: 20 Years After 1990 Elections, Democracy Still Denied". Human Rights Watch. 26 May 2010. Retrieved 14 July 2018. Look up election in Wiktionary, the free dictionary. Wikimedia Commons has media related to Elections.